You know, I keep promising I won’t make more 5:2 diet recipe soups. And then, I try to work out what I want to eat on my 5:2 diet fast days – and I keep coming back to soup. Luckily there are an infinite number of variations on the theme. This time, I was simply using up vegetables that were lurking in the fridge. A sweet potato and a piece of celeriac that had been marked down to 30p! 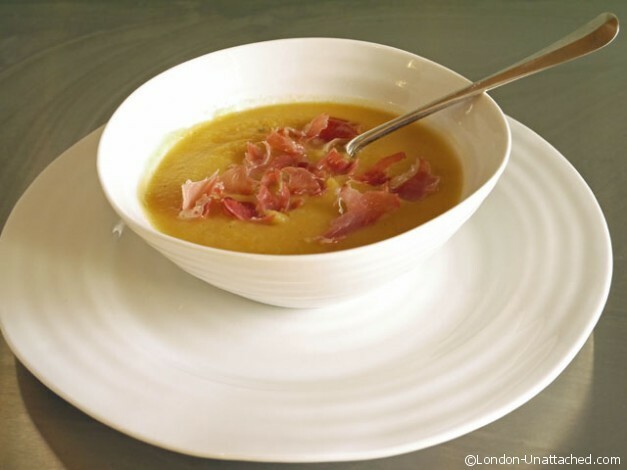 It’s a very simple soup – and I was suprised at how tasty and rich it was. 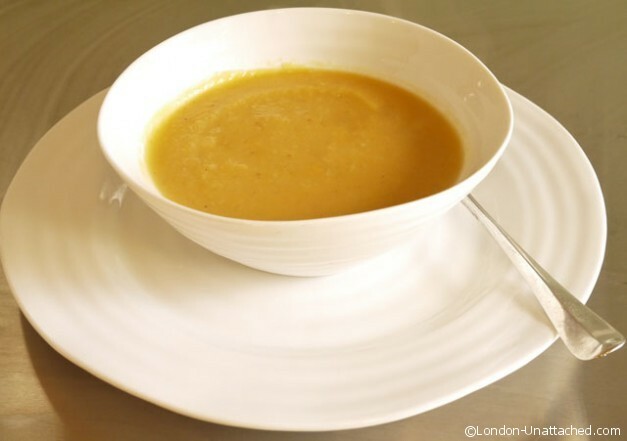 The combination of sweet potato and celeriac makes a naturally thick and creamy soup without the addition of any milk or cream. It’s lovely just as it is, or with a spoon of creme fraiche. But for a change, and because I had a slice of pancetta left over in the fridge, I garnished the finished dish with a bit of crumbled crispy pancetta. You could use bacon instead. Or, if you want to keep the dish vegggie, then a garnish of some crisp croutons or a little caramelised onion would be perfect. This soup without garnish is around 85 calories per serving. Obviously the final calorie count will depend on what you use but half a slice of dry fried pancetta will be around 20 calories. And, it adds just a little protein to the dish, helping to make it keep you feeling full for longer. So, a perfect 5:2 diet fast day lunch. Looking forward to giving this soup a try. Oh yes, that soup looks the business. I adore both celeriac and sweet potato but have yet to combine them in a soup. Will do, next time I have both in my veggie box!